Greater Fort Lauderdale has dozens of sports venues for groups who like to cheer for the players or play for the cheers. Whether your group needs a field to run across or a stadium to watch from, we’ve got plenty of settings to enjoy viewing—or taking part in—all kinds of athletics. Jump to Sport Development for more in-depth resources for sports groups. For all your hockey and ice skating needs, book a rink at the Florida Panthers IceDen. Whether you’re planning some friendly competition, or just want to let your group learn turns and tricks on the ice, the 75,000-square-foot entertainment facility has everything you need. As the official practice facility of the Florida Panther, the IceDen features NHL regulation ice surfaces, plus a conference room and A/V capabilities for any meeting requirement. Groups can also opt to play a round of broomball, a popular choice for up to 50 people that doesn&apos;t even require skates. With over 175 acres of grass, trails, and walkways, Brian Piccolo Park & Velodrome has something for nearly every type of outdoor sport. Find courts and fields for games of basketball, softball, soccer, tennis, cricket, flag football, or disc golf. Secure a permit and have groups of 250 gather and grill on the green grounds. Or, for groups interested in a more specialized activity, check out Florida’s only velodrome, where cyclists can spend a few hours circling the track competitively or recreationally. Looking for somewhere to hold a soccer-based gathering? Americas Got Soccer is an indoor soccer arena perfect for bonding over goals, cheering for the World Cup, or competing for bragging rights. After a match, guests can order a beer from the impressive selection at the Pumas Sports Tavern, and watch a live match on the field—or on the 14-foot screen!—along with all their teammates. Reserve a party room and enjoy an entire section of the bar dedicated to your group with professional catering, optional bubble soccer, and even a free beer tower. 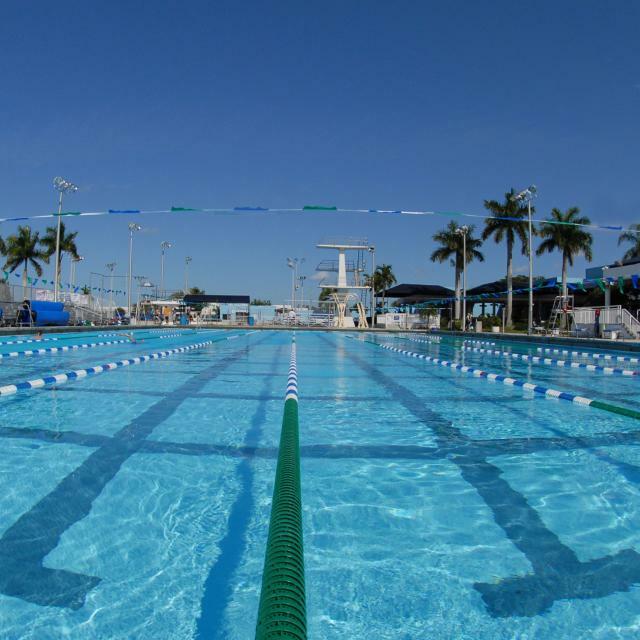 With a 50-meter Olympic swimming pool and separate diving well with a full range of springboards and diving platforms, Coral Springs Aquatic Complex is just the place for swimmers to flock. Here, water lovers of all ages can train, practice synchronized swimming, tighten dives, or just spend a few hours splashing around. After drying off—or before jumping in—groups can head over to the swim shop for suits, bathing caps, flippers, and goggles. There’s also a dry land training area with trampoline, a training pool, and acclamation pool. For the ultimate sports venue, Hard Rock Stadium is the ideal place for meetings, banquets, corporate hospitality, and trade shows. Buy tickets to watch the Miami Dolphins score, or host an event in one of the private rooms to really make an impression. With gorgeous decor and high-end food options, The 72 Club is the ideal event space for luxury celebrations. Dancing fanatics can hit the club scene at LIV, which features views of the field from the dance floor. And with private rooms for 25, or an entire stadium that seats 65,000, there’s no shortage of ways to make a holiday gathering or social event a huge success.